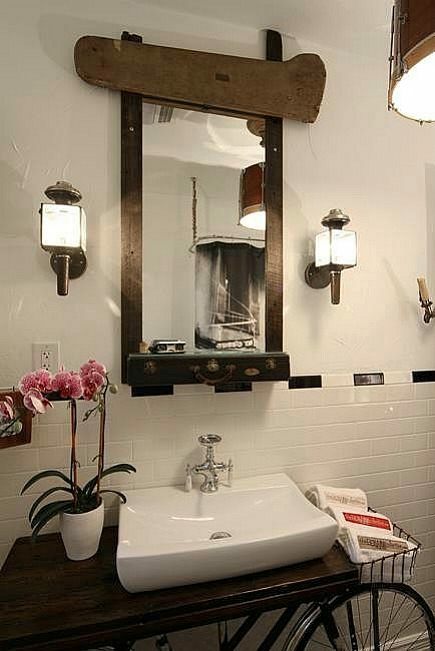 Tossed and found items are repurposed into novel ideas like a bicycle vanity for a bathroom. New Orleans artist Benjamin Bullins gives the old saying “one man’s trash is another man’s treasure” an entirely new meaning. Taking inspiration from a single object, he then uses other materials to build a sculpture. Often his work is functional art — like this whimsical discarded bicycle vanity for a bathroom. A sleek, contemporary sink rests on a wooden board and is paired with a vintage single-hole faucet. I love the porcelain drop handles. That’s mounted in place of the bicycle seat — the front basket is perfect for hand towels. The black and white checked floor tile pattern mimics checkered flags used when the winner of a race crosses the finish line. That’s in keeping with the room’s theme, since similar flags were first used in French 19th century bicycle races. The mirror is another mixed media piece Bullins assembled, this time from a trombone case. One side of the case was fashioned into the top of the mirror, while its handle and latches are at the bottom. A pair of coach lights gives a nod to a predecessor to the bicycle– the horse drawn carriage. And don’t miss the tongue-in-cheek ceiling fixture (upper right and reflected in the mirror) — a drum shade made from the outer shell of an actual snare drum. We’ve seen repurposing genius similar to Bullins’ — notably the Furniture that Speaks to Us, furniture made from repurposed signs by British scrapper/sculptor Rupert Blanchard. This pair will have us thinking twice before tossing something out with the trash. How fun is that! 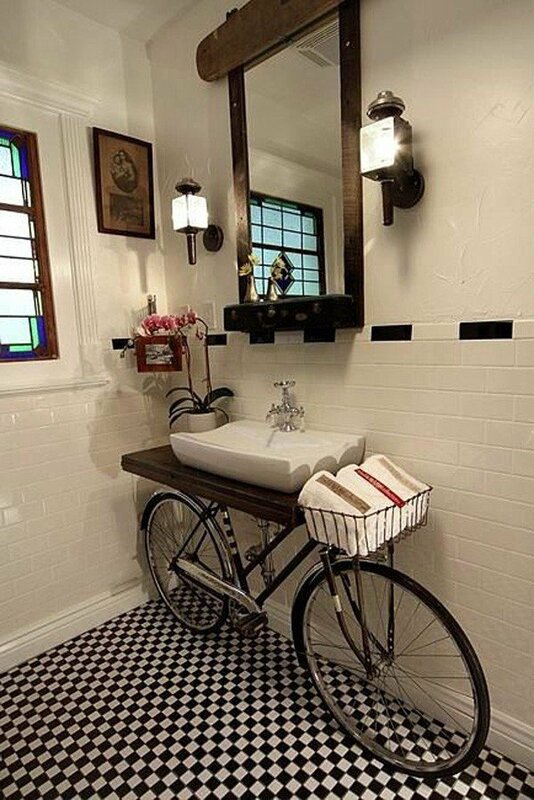 Love the handlebar basket used for towels. Cute idea! Thanks for sharing. I used this bathroom. The door (reclaimed and recycled of couse has a sign on it saying to use other door. There is no other door. The towel bar is the handelbars from the bike. The entire bathroom is awesome! The living room is decorated with found objects aslo. The loveseat is the focal point of the room. It’s made out of and old Chevy truck tailgate, wheels from an old scaffold and is upolstered in steerhide. The concept is incredible.